John Ashworth. Untitled. 2018. Acrylic on prepared panel. 18" x 18"
John Ashworth. Untitled. 2017. Acrylic on paper mounted on panel. 18" x 18"
John Ashworth. Untitled. 2015-17. Acrylic on paper mounted on panel. 18" x 18"
John Ashworth. Untitled. 2015. Acrylic on prepared panel. 24" x 24"
Mark Webber. Untitled Wall 7. 2018. Hydrocal. 8" x 5" x 4"
Mark Webber. Flight. 2018. Hydrocal. 36" x 6" x 3"
Mark Webber. Tempest. 2018. Hydrocal. 11" x 9 1/2" x 3"
Mark Webber. Archimede. Hydrocal. 2018. 33" x10 1/2" x 4 1/2"
Gordon Moore. Untitled. 2018. Ink & paint on photo emulsion paper. 14" x 11"
Gordon Moore. Untitled. 2012. Ink & paint on photo emulsion paper. 16" x 12"
Anita Rogers Gallery presents a group exhibition of work by three artists: John Ashworth, Gordon Moore and Mark Webber. The gallery is proud to introduce John Ashworth to the gallery for the first time; Ashworth’s detailed acrylic paintings on paper, canvas and panel are rich in texture, detail and illuminated color. 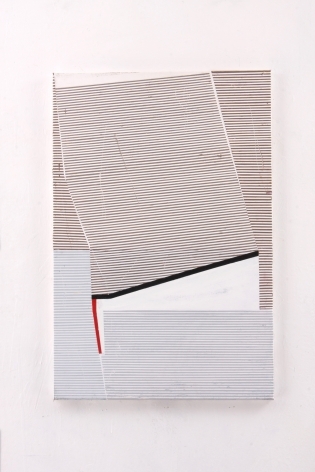 Moore’s works on photo emulsion paper explore depth, perspective, balance and asymmetry. 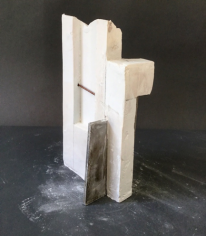 Webber’s hydrocal and plaster sculptures recall architectural forms but are firmly sculpture; the works are defined by their elegant lines and careful balance. The exhibition will be on view January 9 – February 2, 2019 at 15 Greene Street, Ground Floor, New York, NY 10013. Born in New York in 1939, painter/sculptor John Ashworth began appreciating art at the age of 8 while visiting seminal institutions such as Metropolitan Museum of Art, The Museum of Modern Art, and Whitney Museum of American Art — as well as 57th Street galleries. Two years later, his own work hung — with that of artists many years his senior — at Washington Square Park. Exhibition attendees purchased all of his hundreds of folded, Rorschach-type blots in poster paint on typing paper pasted onto vertical scrolls. After moving to Massachusetts, where he graduated from high school in 1956, John pursued applied industrial physics at Wentworth Institute in Boston. From there, he majored in civil and structural engineering at Northeastern University and then attended Harvard University Graduate School of Design and, on scholarship, Boston’s School of the Museum of Fine Arts at Tufts. Born in Cherokee, IA, Gordon Moore received his undergraduate degree from the University of Washington, Seattle in 1970 and then went on to receive his MFA from Yale University in 1972. He has received numerous awards and grants including the National Endowment for the Arts-Visual Artists Fellowship, the Louis Comfort Tiffany Foundation Award in Painting, the Adolph and Ester Gottlieb Foundation Award in Painting, the Academy Award in Art from the American Academy of Arts and Letters, Pollock Krasner Foundation Grant and the New York Foundation for the Arts Fellowship. Moore’s work can be seen in the collections of the Museum of Fine Arts (Boston, MA), Yale University Art Gallery (CT), Baltimore Museum of Art (MD), General Electric Corporation (OH), the Krannert Art Museum (IL) and Kinkead Pavilion (IL). Most recently, Moore’s work was shown in a major solo exhibition at the Salina Art Center in Kansas. The gallery will host a solo exhibition of work by the artist in February 2019. Mark Webber resides in Sag Harbor, NY where he has worked as a cabinetmaker for many years. There he learned the craft of making objects and put in his time to develop that ability. Webber studied under Charles Ginnever and Peter Forakis at Windham College in Vermont. He received a BFA in sculpture at SUNY, Purchase. He has exhibited at many galleries in the Hamptons and is in several private collections on the East Coast.